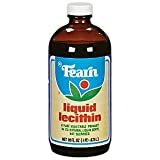 What Is Liquid Lecithin Used For? Lecithin is a phospholipid, which is a type of lipid (fat molecule) that helps make up cell membranes in the body. It is important for skin health and for brain health, where it makes up a large part of the myelin sheaths that surround nerves. Lecithin is made of phosphatidyl esters, in particular phosphatidylcholine, phosphatidylethanolamine, phosphatidylserine, and phosphatidylinositol. This nutrient is also a precursor for the neurotransmitter acetylcholine and has shown beneficial effects on the brain and memory performance. Lecithin supplements come in different formats, including granules, powder, soft gel capsules and liquid formulations. Liquid lecithin can be taken orally or applied topically to the skin. People take this supplement for a number of different reasons, from cognitive enhancement to skin health to weight loss to cholesterol reduction. Liquid lecithin is also used as an emulsifying additive in processed foods. Lecithin products are typically made from soybeans, but can also be made from sunflower for those who are allergic to soy. Purported liquid lecithin benefits include improving cholesterol levels and benefiting certain health conditions including Alzheimer’s disease and liver and gallbladder diseases. Many therapies used to treat dementia, Alzheimer’s disease and memory impairment work by increasing cholinergic activity in the brain. This refers to all of the signalling pathways that involve the neurotransmitter acetylcholine. Consuming lecithin and other forms of choline supplements helps to increase the availability of acetylcholine precursors in the brain. This has been theorized as one way to support memory and brain cell health as we age. However, NMD notes that there have been no long-term studies looking at the effects of lecithin on dementia or Alzheimer’s. In short-term studies involving lecithin supplements, there have not been significant changes in memory or cognitive function for patients with these forms of age-related memory impairment. Lecithin has not been approved by the FDA for the prevention or treatment of dementia or Alzheimer’s disease. NMD also explained that more research is needed on lecithin for cholesterol lowering as some research supports its use for this purpose while other research shows no results. Liquid lecithin is also commonly used for moisturizing the skin. It is added to skin care products and used for certain conditions, including dry skin and dermatitis. NMD states that this ingredient is commonly used as a humectant in topical products and appears effective anecdotally, but quality clinical research is not available to confirm results. One research report considered hydrogenated lecithin for the skin. It explained that lecithin is used in many cosmetic products to condition skin and to emulsify ingredients to achieve the right consistency. The FDA has not established standardized dosage guidelines for Lecithin. According to the Natural Medicines Database, dosages of between 1,000 mg to 25 g of lecithin have been used in research trials. In research studies on dementia, dosages administered have ranged from 1,000 mg or 1,600 mg daily for three months. One clinical trial involving Alzheimer’s patients used 10 – 25 g per day for six months. Another trial used 100 grams of lecithin per day, standardized to provide 5.9 grams of choline. Studies of lecithin for cholesterol and lipid lowering effects have used 1.80 g daily for six weeks of a dried complex mixed with soy stanols. A study looking at the effects of this supplement on stress used a 400 mg dose of a phosphatidic acid and phosphatidylserine complex derived from soy lecithin. Your recommended dosage could vary based on the reason for taking lecithin, health condition and age. It is recommended to talk to a doctor for specific guidelines in taking liquid lecithin as a health supplement. Lecithin is available as a dietary supplement in various forms. In addition to pure liquid lecithin, there are granules, powder and soft gel capsules available. Lecithin pills can be taken with water according to the package directions or a health professional’s advice. Bulk powder or granules can be added to foods or beverages to ingest or dissolved and used topically in a skin care treatment. Many consumers prefer liquid formulations of lecithin, especially if using a dosage greater than 2 g per day. It may be inconvenient to swallow multiple pills daily if consumed in tablet form. Liquid lecithin can be added to food or beverages, such as mixing it into a smoothie or protein shake. Liquid forms are also best for topical application, compared to granules or powdered forms. That is because the powder and granules need to be dissolved while the liquid product comes in a ready-to-use format. Liquid lecithin sold online is generally made from soy, but other sources are available as well. Sunflower liquid lecithin is a popular option for those who experience an allergy or intolerance to soy or are concerned about soy and estrogen. The Natural Medicines Database classifies lecithin as likely safe when used appropriately in different forms. NMD recommends pregnant and lactating women avoid using this supplement as there has not been sufficient research into its effects on these populations. The FDA has also rated Lecithin as Generally Regarded As Safe (GRAS) in food products. In clinical studies, it has been well-tolerated and only mild side effects were reported. Most reports of side effecs involved digestive problems such as nausea and stomach discomfort. Lecithin may interact with Diclofenac, which is the active ingredient in Voltaren gel. When applied topically together, lecithin seems to increase the absorption of this ingredient. There are no known interactions with other medications, herbs, supplements, foods or diseases. While not likely, people with a soy allergy or intolerance may experience negative reactions to minor amounts of soy protein present in soy lecithin. Using sunflower liquid lecithin may be a better option for individuals who are sensitive to soy. People commonly use liquid lecithin for skin care to moisturize dry skin or help with specific conditions. Lecithin supplements are also used to support brain health, liver function and healthy cholesterol levels. Consult with a doctor before using this product for any medicinal purposes. Lecithin - Mountain Rose Herbs.